As your local roofing contractor in Versailles, KY we work hard to provide the best service and value to all residents of Woodford County. Whether it’s a residential or commercial project, a small roof leak repair, new installation or just a simple shingle repair we can help! We have a rental home in Versailles and we live out of state and we needed someone we could trust to take care of our roof. Our management company sent out someone who initially said we might need a new roof, our roof is only 7 years old and then after 2 weeks we still did not have an estimate so we called Lexington Blue who told us that our roof looks great and the problem ended up being just the flashing. Lexington Blue returned our call within an hour, came out right away, sent us pictures of all the work They are very honest, do quality work and dont try to charge you for things you dont need. We would never use another roofer. We highly recommend them to anyone who needs a roofing company they can trust. Special thanks to David, Keith and Susie who helped us in every way they could. We also provide repairs for siding, window replacement services, gutter installations and other home remodeling services. You’ll immediately notice how we set ourselves apart from other roofers in Versailles. It’s our commitment to provide you with the best experience that other roofing contractors fail to offer. In general, our SSA is your first face to face company representative that you will meet. Their job role is to determine what type of roofing needs you have. It may be a common roof leak that needs repaired, inspection of your roof or maybe you require them to assist you with filing an insurance claim for repairs to your roof. All in all you can expect that our SSA will listen first, investigate second and finally with an unbiased opinion provide you with the best recommendation that fits your requirements. With each roofing project we take on we have an onsite quality control manager who stops in to oversee that each job is installed with the best workmanship and completed in a timely fashion. This is one major difference that sets us apart from other roofing companies in Versailles. You can expect a quality and efficient installation. Some of the hardest workers within our company! 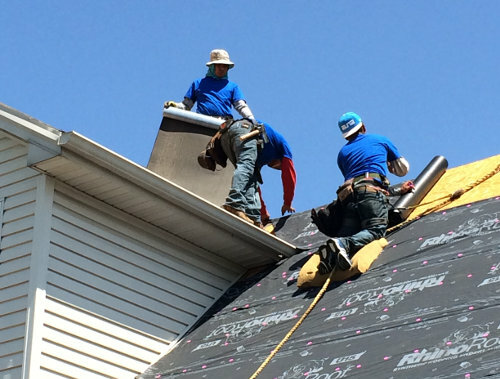 Our roofing crew has the experience to take on any type of repair or installation. Their knowledge is backed with continued education for adhering to the best installation methods. You’ll find that each of our crew is very respectful of your property and your personal environment. Committed to oversee every detail of every job is our owner, Brad Pagel. You could say his commitment to your satisfaction is the definition of “going over and beyond”. In today’s contracting environment it’s the smallest details that seem to make the difference. Brad recognizes this and without fail ensures you as our client are extremely satisfied. Many of our clients want to know…. Who are the best roofers in Versailles? Well, at the risk of sounding boastful, our clients can speak for us about our level of commitment and customer satisfaction. Among our dedication to quality workmanship, you can also consider our reputation by viewing our A+ BBB rating we hold. It’s the professionalism you desire and the quality experience we provide when you select us as your roofing company.